ANCHORAGE (CN) – Alaskans for and against drilling in the Arctic National Wildlife Refuge offered their opinions during the final public scoping session held by the federal government Monday. The U.S. Department of Interior’s Bureau of Land Management hosted the public meeting specifically to address the draft environmental impact statement for the Coastal Plain Oil and Gas Leasing Program, which the bureau made available for public review and comment this past December. Federal law requires environmental assessments with public input before any lease sales can be held. Monday’s event in Anchorage ran longer than the allotted six hours but allowed most of the 70 people who signed up to formally address the panel of Interior agencies overseeing the lease sale and drilling within the coastal plain area of the Arctic National Wildlife Refuge and the U.S. Fish and Wildlife Service, which oversees the land and animal conservation in the refuge. Six other public testimony open houses have taken place across Alaska since Feb. 4, after the required public comment period was extended to March 13 due to the recent government shut-down. The Anchorage meeting allowed for both public speakers and the submission of comments in writing, a change from the first meeting in Fairbanks, Alaska’s second largest city. That meeting was organized as an open-house style with scientists and agency representatives standing next to posters and signs explaining the environmental impact statement draft process while two court stenographers sat behind a curtain to take testimony from members of the public. The Fairbanks meeting turned raucous, with attendees blasting the open-house style as inadequate because they could offer public comment at a microphone for the audience to hear. Nicole Hayes, project coordinator for the Bureau of Land Management, said organizers had thought the open house would provide more options for interaction by the public and a smoother flow. After giving an overview of the process of drafting the environmental impact statement, Hayes noted at this point lease sales do not necessarily mean drilling will occur and the process is about hypothetical impacts. She added the information gathered during public meetings will inform the five alternatives for conducting the lease sale. However, alternative A – no action – cannot be pursued since it does not comply with Murkowski’s rider in the tax bill, which is now law. Options B through D1 and D2 were variations on offering the fewest acres, portions of acreage or entire area for lease sale. The law requires no fewer than two lease sales area-wide within 10 years, with the first within four years and the second within seven years, and no fewer than 400,000 acres offered in each sale. Critics say the tax bill overstated what the federal government will earn from lease sales. 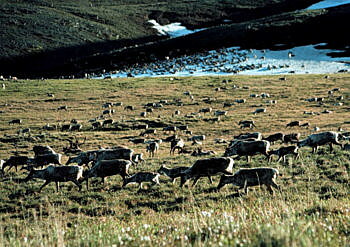 They say development will create a web of roads and pipelines and could harm the porcupine caribou herd. 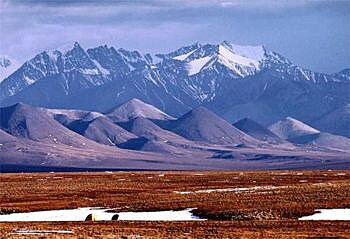 Drilling within the refuge has long pitted Alaska Native villages of Kaktovik on the northernmost edge of the refuge against Arctic Village on the southernmost edge. Many of Inupiat decent in Kaktovik are for drilling, hoping it will bring more jobs and revenue to the community. But those in Arctic Village and smaller communities nearby fear the negative impacts on their subsistence way of life, which relies on the migration and hunting of caribou. “Caribou are recession proof,” said speaker Rochelle Adams. Adams, who grew up in Gwich’in villages of Beaver and Fort Yukon but now lives in Anchorage, spoke passionately about what the impacts of drilling could mean to her and the place she grew up and where her parents are buried. “When the economy fails or the government shuts down, there will still be subsistence hunting,” she said, urging her Inupiat relatives to place more value on the land and animals over currency. Adams and others speaking against the lease sales said they felt rushed to review more than 300 pages of the recently released draft statement before the comment period ends. Adams also criticized the process as lacking input and traditional knowledge of elders in the affected communities, many of whom speak or read only in their Alaska Native tongue. Adams, who called herself a linguist, culture bearer and elder in training, said the document should be translated in Athabaskan and Inupiat and be sent to all the communities. When asked about translating the draft statement, Hayes said the communities have a federal contract for translation and that when in the communities, federal agencies hire a local translator to help conduct the meeting. But a fair number of speakers touted the lease sales and future drilling. Some reminisced about the lean days before oil drilling came to the state and believe that with advances in technology and oversight, responsible resource extraction is possible. “I’m in my 49th year in the 49th state,” resident Roger Jenkins said. “Go on with this ANWR thing and get it done,” he said after telling of his time living in villages along the Iditarod gold mining trail, traveling to Washington and now living in Anchorage. James Caswell, a retired coal miner from Alaska’s Usibelli mines, said he supported drilling after describing his work as a miner with a very responsible Alaska family-owned company. Besides Anchorage and Fairbanks, public scoping meetings were held in communities of Kaktovik, Fort Yukon, Arctic Village and Venetie, and will wrap up in Washington on Wednesday.